Adams Estates specialise in all aspects of residential property. We can sell your home for you and help you buy a new one, or we can manage a single rental property, or a portfolio of properties on your behalf. We put our customers first, and we strive to deliver exceptional service, comprehensive advice, and outstanding results without fail. ADAMS ESTATES IS ONE OF THE LEADING LETTINGS AND ESTATE AGENCIES IN DEWSBURY. OUR KNOWLEDGE OF THE LOCAL PROPERTY MARKET IS SECOND TO NONE, AND OUR EXPERIENCED, FRIENDLY TEAM WILL DELIVER FAST, EFFECTIVE RESULTS, WHATEVER YOUR PROPERTY REQUIREMENTS. Our sales team consists of senior property professionals with extensive knowledge of the local housing market. Our experience has taught us that a successful sale relies on good advice, and effective communication. We pride ourselves on the quality of the advice we offer our clients and will go that extra mile to suggest ways to improve your chances of a sale, and get the best return on your investment. We ensure that we communicate effectively, so that you feel in control throughout the process. We work together with both parties during the transaction to provide a comprehensive service, informed negotiations, and a successful result. We understand that successful lettings come from a long-term approach, a sound strategy, and a solid relationship with the landlord. We take the time to understand everything about a property to enable us to match properties with tenants, and tenants with landlords. We build and nurture our working relationships at the same time as taking care of the day-to-day management of the property. 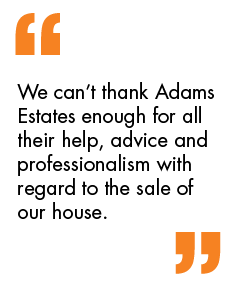 Our approach has helped us establish Adams Estates as one of the best lettings businesses in Dewsbury, and strengthen reputation in the market. As a landlord, you will be given access to a secure online tracking system, which enables you to access details such as tenant information, deposit and income updates, and safety certificate alerts. Our experienced team of property managers are available to assist you every step of the way, drawing on their experience and unique knowledge of the Dewsbury property market to deliver the best service possible to our landlords and tenants. In addition to property sales and full property management, we also offer a ‘Let Only’ service to landlords, to assist in finding new tenants. When buying a new home, we can introduce you to specialist mortgage advisors, for independent advice on financing a purchase. We can also recommend an expert solicitor to undertake conveyancing work. We will arrange property maintenance for rented accommodation, including repairs, acquisition of safety certificates, and completion of energy performance certificates. When you are selecting an estate agent to manage and advise on your first or next home move, it is important that you choose that understands your needs and requirements. Our expert property team have years of experience in the Dewsbury housing market and estate agency business, this means that our clients are assured that, with our knowledge and experience, we offer only the very best advice, customer care and estate agent service.